In the Winnipeg area, dryers are a must-have for any multi-unit property. Not only do these appliances dry clothes from the washing machine, but they can provide a much needed break from a winter chill! Since the days of clotheslines have passed, dryers have become less a luxury than a necessity, particularly for multi-unit properties. When laundry rooms are servicing apartment buildings, condo complexes, or any other strata or co-op spaces, routine maintenance is key. 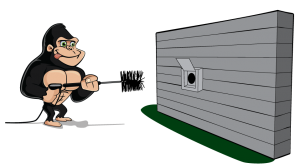 Keeping your laundry facilities running smoothly is as simple as contacting a Gorilla for your Winnipeg dryer vent cleaning. Owners and managers of multi-unit properties are responsible for the comfort of dozens of tenants every day. This applies to the condition of their properties but also to keeping amenities functional in residential and commercial spaces. When big-ticket appliances like dryers begin to lose their efficiency, it makes life difficult for everyone. Repeat cycles add unnecessary milage to your machine, by forcing your dryer to run extra loads, shortening its life cycle and becoming a real headache for those tenants attempting to use them. One of the biggest issues to arise with dryers in multi-unit properties is blocked or clogged vent systems. With each load of laundry that passes through your system, minor bits of dryer lint and other debris will sneak passed screens and lint traps. With nowhere else to go, this debris will simply sit inside vents, collecting little by little until it begins to limit air flow. This reduced airflow keeps clothes from drying properly and encourages multiple cycles, creating more debris and even more issues. Sitting lint and clutter is known to trap allergens, house mould and can even lead to a dryer fire. Don’t let lint buildups get the jump on your communal laundry space when you can call a Gorilla for your Winnipeg dryer vent cleaning instead. As lint builds, it becomes highly flammable, so quick action is a necessary part of proper cleaning practices. Calling a Gorilla for your property maintenance needs means prompt service, skilled technicians and expert results. Instead of simply wiping away reachable areas of your ventilation system, our Gorillas use specialized tools to track blockages throughout the entirety of your system. By restoring your vents to their former glory, our Gorillas can keep your system running smoothly through routine maintenance.